Organize your pouch laminator, pouches, and accessories in one location. 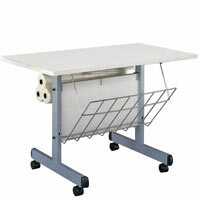 This sturdy metal workstation provides a place for everything you need to make your laminating job easy. The large (4-1/2 square feet) melamine working surface is large enough to fit any pouch laminator. 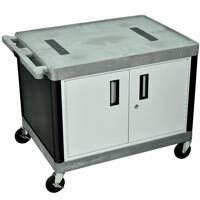 Simple yet functional laminating cart has an extra large top (42" w X 26" d) to accommodate most laminators. The supply rack (25") holds pre-laminated items and the convenient film rack stores rolls of film up to 27" in width. Grey laminate top and frame with 2" locking casters. 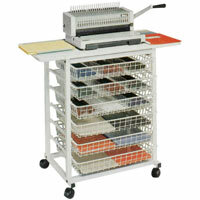 This heavy-duty laminator cart fits most roll laminators up to 27 inch width. 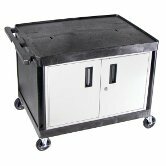 It includes 4 inch casters (2 are locking) to move your machine to where it is needed. The built-in electrical power strip has 3 outlets and a 15 foot power cord. The locking doors have recessed handles for safety.